We eat a lot of fresh produce but most of it comes from my dad's garden. His garden is big enough to clearly spot from space, I think! Having our own garden allows the boys to more closely observe the growing process. There is so much learning that can take place as our garden grows. We can investigate using science. We can use math skills as we record progress. And of course, we can mix reading and writing in to our gardening. As we prepared our green bean seeds for planting, I decided to create a way for the boys to record the progress of the bean plants. We created a little book as our recording method. We are still in the process of creating our book but I created a sample of how the book might turn out. Logan contributed page one! I created this little book as a free printable for you so you don't have to remember our entire plan. You can download it for free by clicking on the photo above! (Some of our photos look a little different from the printable because I tweaked it as I went along). Click on the picture for the free booklet. Directions for folding a little book can be found here. Look at the seed. Describe how it feels. Draw a picture of the seed. Use piece of string to measure the seed. Tape the string on page one. Record the date. Also on Day one, put a few of the seeds to soak in water. Put a few seeds in a plastic bag with a wet paper towel. Observe the seeds that have soaked. Describe them. 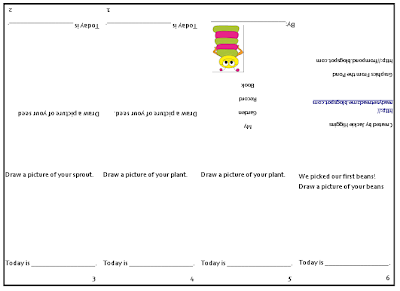 Draw a picture of the seed. 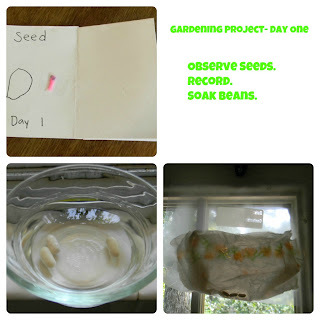 Use a piece of string to measure the seed. Tape the string on page two.Record the date. Also on Day 2, plant the soaked seeds in a clear jar with soil. (I'm not sure how this will work because it might not have enough drainage? But I saw it somewhere? Pinterest? So we will try it). Day three will be the day your beans sprout. This may not be a consecutive day. Look at the sprouts. Describe the sprouts. Measure with a string. Tape the string to page three. Record the date. Also observe the sprouts in the soil. Once you have a plant that is tall enough to measure, record the height of the plant by measuring with string. Tape the string to the book. Record the date. Continue to observe the plants. Draw a picture. Use a piece of string to measure the height and tape it in the book. Don't forget to include the date. Record the date of your first pick. Draw a picture of the bean or of yourself eating the beans! Hopefully I will be able to update our progress as our garden grows! This is a blog hop. This hop is for anything related to growing with kids - flowers, plants, gardens, veggies, etc! It will run from 5/28/12 thru 6/4/12. Feel free to link your blog posts and/or go check out some other great gardening ideas. What a great idea! Thanks for making the printable! I really enjoyed reading this post. It is wonderful how you involved your child in this project. The printable is awesome. Thank you for sharing. Great gardening ideas. I pinned this post to my gardening board on pinterest. We're always in the gardens around our home! Just came in from a morning of exploration among our plants! What wonderful ideas! It is so wonderful to get outside and dig in the dirt. What a great book and activity! I invested about 300 dollars into a large potted garden last year that grew a few things but it has been abandoned. We really enjoyed nurturing it but the heat and humidity where we are just mutilated it!!!! I didn't have enough knowledge to save anything! Good for you for building yours!